Word of Life is preparing for our annual 21 days of Prayer and Fasting, beginning Monday, January 7th and continuing through Sunday, January 27th. We ask you to begin to pray now about what type of fast you will do. We ask that everyone fast something and seek the Lord with us during this time. 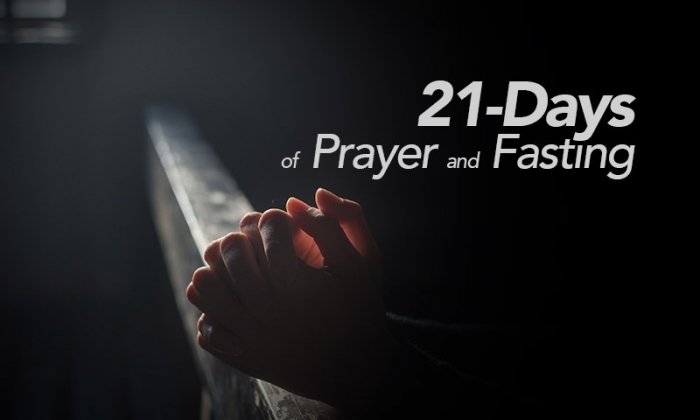 Here at WOL, we encourage fasting corporately for 21 days each year in the month of January. This is part of a season of high-intensity prayer as a church family, with the goal of drawing nearer to God. Biblical fasting always has to do with eliminating distractions for a spiritual purpose; it hits the reset button of our soul and renews us from the inside out! Be thinking about what you might fast during these 21 days, which begins Monday, January 7th and continues through Sunday, January 27th. Facebook Live Prayer (Monday to Friday at Noon) – Tune in to our Facebook Live stream at facebook.com/wolashburn for a 30 minute prayer service led by one of our Pastors. Videos will be saved for later viewing.